The APK itself can support a number of different lag fixes, but currently only a simple EXT2 lag fix is available in it. Root + Superuser – The APK includes an update.zip that will root+superuser your device. Android 2.1 does not support auto-running/recovery mode from apps, so you will have to manually enter recovery mode. Android 2.2 does support this, so it may be added in the future. EXT2Tools – This installs the correct busybox and some ext2 tools for checking the filesystem, etc. OneClickLagFix V1+ – The included lag fix is called ‘OneClickLagFix V1+’ and is a heavily checked version of the original 1.0 One Click Lag Fix Script. It contains additional checking, the app and app-private folders, as well as filesystem checking on boot. It has a slider that controls how much space the lagfix will use. Further to right will mean you can install more apps, but you may have to remove some when undoing the lagfix. Further to the left means less space for new apps, but will make it much easier to uninstall. OneClickLagFix V1+ Remover – This should painlessly remove the lag fix for you. Space Checker – You can check the amount of free space still available for apps after the lag fix is installed using the option in the app. Works for all lag fixes. Change Scheduler – Changes the kernel I/O scheduler. More details in app. What is this lag fix version for? A lot of people have trouble with the script versions. This aims to make a simple lag fix that anybody can use. It has a lot of checks, and does not remove any files that the system is using. This hopefully means that this lag fix will cause zero problems. In the event that a lag fix fails, the app should undo the lag fix and leave your device as it started. You will have the option to mail the log to the lag fix developer (me in the case of the stock lag fixes). This is currently in RELEASE status. Feel free to report any issues/bugs in this thread! Copy over the APK file onto your phone, and run/install it as normal using ‘My Files’. There will be a ‘One Click Lag Fix’ app installed. Run that, and select the option you want! The app will automatically kill all running tasks, and enable flight mode. You should probably not use the device while the lag fix is running. If you accidentally hit back or home by mistake, re-enter the app and re-select the lag fix. It should still be running. You may see a delayed splash screen on boot. This is because the EXT2 filesystem is being checked at this point. Quadrant scores should be around 2100. Use the included uninstall option before applying an OTA update, or updating using Kies. Updates using Odin will overwrite the lagfix. You do not need to reinstall this lagfix when the app is updated. The version on the V1+ lagfix itself has not changed. You will only need to reinstall for V2 or other changes. Coming soon. Kryptyx has uploaded the app to the android market – It is listed as “RyanZA’s One Click Lag Fix”. 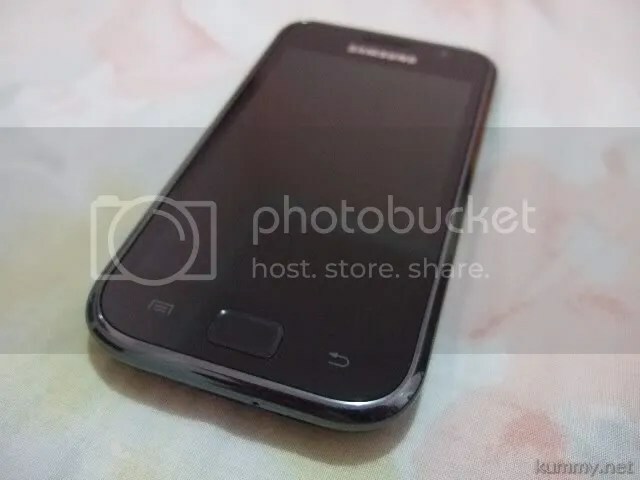 Posted in Android and tagged Android, Click Lag Fix, Ext2, Handhelds, Installation (computer programs), samsung galaxy s, Samsung i9000, Superuser. Bookmark the permalink. Samsung Galaxy S (SGS) memang salah satu handheld android terbaik saat ini. Namun, ada kesan ‘lag’ dalam menjalankan aplikasi. Nah, untuk mengatasinya, teman dari XDA-developers membuat script yang membuat SGS berjalan cukup cepat. Bahkan melewati Froyo (Android 2.2) versi betanya. SGS ini menggunakan Eclair 2.1 I9000DDJG4. Mengagumkan bukan? Sebelum diberikan One Click Lag Fix, hasilnya cuman 800-900an. Kenapa bisa demikian? Pada prinsipnya, lagfix ini membuat virtual file system dalam format ext2 dengan ukuran 4KB Block Size sebagai buffer antara real file system dan android system. Atau istilahnya sebagai cache. Jadi adanya cache ini akan mengurangi aktifitas I/O dari SGS yang lemot dengan memanfaatkan kelebihan dari format ext2 yang memiliki access speed yang cepat. 1. SGS harus di rooted terlebih dahulu. 2. Install aplikasi Busybox 1.17.1 di SGS. Dapatnya dari mana? Bisa didownload di sini. Baca baik2 juga. Busybox ini hanya dapat diinstall bila SGS sudah diroot. 3. Baru jalankan One Click Lag Fix. b. Download the attached ZIP file. f. SGS akan tetap stanby tanpa ada proses reboot. Posted in Android and tagged Android, eclair, froyo, lag, one click fix, samsung galaxy s, SGS. Bookmark the permalink. San Fransisco – CEO Google Eric Schmidt boleh saja bilang tak lagi tertarik untuk memasarkan ponsel setelah Nexus One. Namun itu bukan berarti Google tak lagi mengembangkan Android. Sebaliknya, Google justru sedang getol-getolnya mengembangkan sistem operasi Android. Selain berencana melakukan ekspansi, raksasa internet itu juga ingin merangkul lebih banyak lagi pengembang aplikasi. Google disebutkan memiliki rencana untuk melebarkan sayap Android ke India dan China. Mereka kabarnya ingin membenamkan Android ke ponsel-ponsel murah besutan Huawei dan LG di pasaran Asia dan Eropa. Para pengembang aplikasi didorong untuk menciptakan lebih banyak apilkasi berbasis Android, dengan iming-iming jumlah insentif yang lebih besar. Sebagai informasi, kebanyakan pengembang aplikasi Android mendapatkan insentif dari iklan yang disematkan pada aplikasi buatan mereka atau dari honor sekali bayar. Google memang masih jauh tertinggal dari Apple dalam hal aplikasi mobile. Aplikasi yang tersedia untuk platform Android saat ini hanya sekitar 65.000 buah, kurang dari sepertiga aplikasi yang dimiliki Apple, yang mencapai lebih dari 200.000 aplikasi. Posted in Android and tagged Android, gogle. Bookmark the permalink. We were at the event held this morning by Verizon, Motorola and Adobe this morning for the introduction of the Droid X and we were able to walk away with the latest Android smartphone. The fist thing that jumps out at you is the big screen. It’s the same size as the HTC EVO 4G but the handset is a lot thinner and longer. It’s incredibly thin except for the top of the handset where Motorola put in the camera unit. That extra bulk for the camera does make it a tad top heavy but it’s by no means a deal breaker. The Droid X feels good in your hand and is nice with a somewhat rubbery finish. I still prefer the weight and density of the EVO 4G but the Droid X is a well-designed device. The screen is the same resolution as the Droid (854×480) and, while it’s good, it doesn’t pack the “wow factor” of something like the iPhone 4 or the Samsung Galaxy S. Colors are pretty vivid and text is quite legible. The menu, home, back and search buttons are hard keys and I don’t like the feel of these. These buttons feel kind of loose and jiggly and I don’t know these will handle over long-term usage. The next Motorola smartphone also packs a ton of features inside as it keeps pace with the competition by rocking a 1 GHz Texas Instruments OMAP processor. We haven’t put it through too much stress but apps switch quickly and I haven’t seen any lagging. 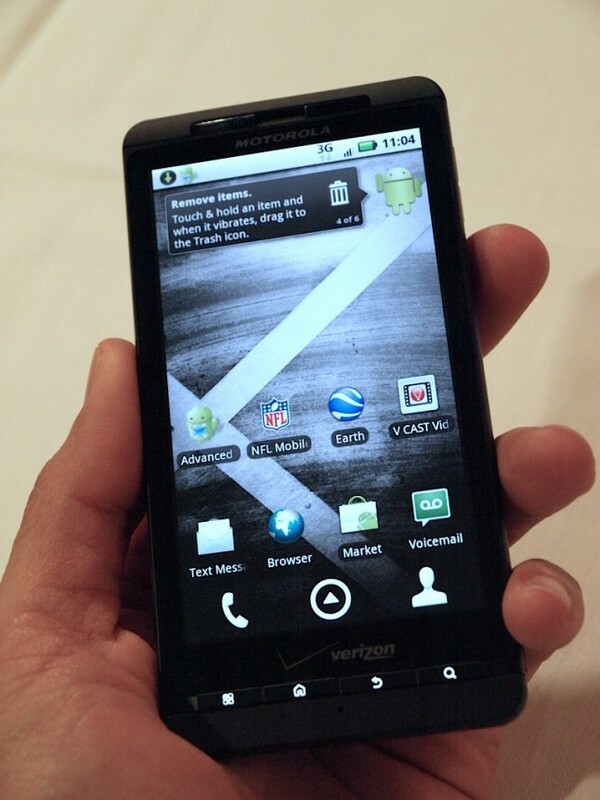 The Droid X also keeps pace with Droid Incredible and the EVO by rocking an 8-megapixel camera. This shooter can also record 720p HD videos and there’s a dual-LED flash. You’ll be able to view those videos in its full glory via an HDMI-out cable. The handset also has three microphones that should help with voice quality and voice recording. I’ve only made one two-minute call with the handset so far and it sounded clear. We’ll have more on the voice quality in our full review. 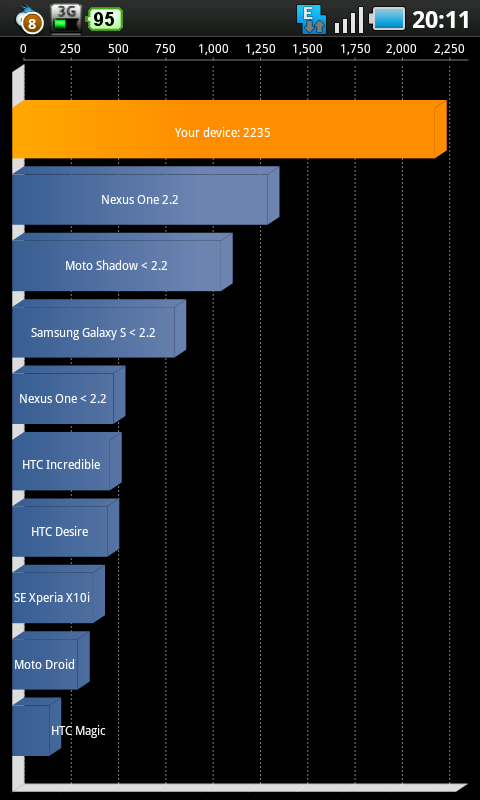 On the software side, you may be disappointed to learn that it rocks Android 2.1 with a touch of MotoBlur. Posted in Android and tagged Android, droid, droid x, motorola. Bookmark the permalink. Posted in HidupKu and tagged Android, indosat. Bookmark the permalink.